Got a question about Daycast? Find frequently asked questions—and their answers—here. Click your question to expand the answer. Don't see your question here? Either click the Help widget at the bottom right of this page to contact us or send your question via email to support@daycast.com. We're happy to help. If you haven’t downloaded Daycast yet, start there. You’ll see instructions for installing after the download has begun. Once installation is complete, open Daycast and choose I’m New. Then create your account by providing a first name, last name, email address, password, and your acceptance of our Terms of Service. Click Create Account and you’ll be logged into Daycast. If you’ve already downloaded Daycast, follow the installation instructions for Windows here or for Mac here. (Can’t find the installer? Check your Downloads folder or just download Daycast again.) Once installation is complete, open Daycast and fill out the form fields to create your account. 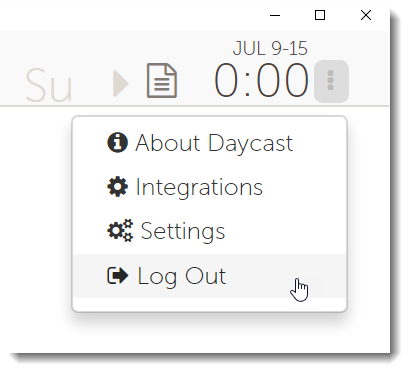 If you’re already a Daycast user but want to create a new account, simply log out of Daycast by clicking the vertical ellipsis in the upper right corner and choosing Log Out from the dropdown menu. Next, click the Create Account text link offered on the resulting screen. 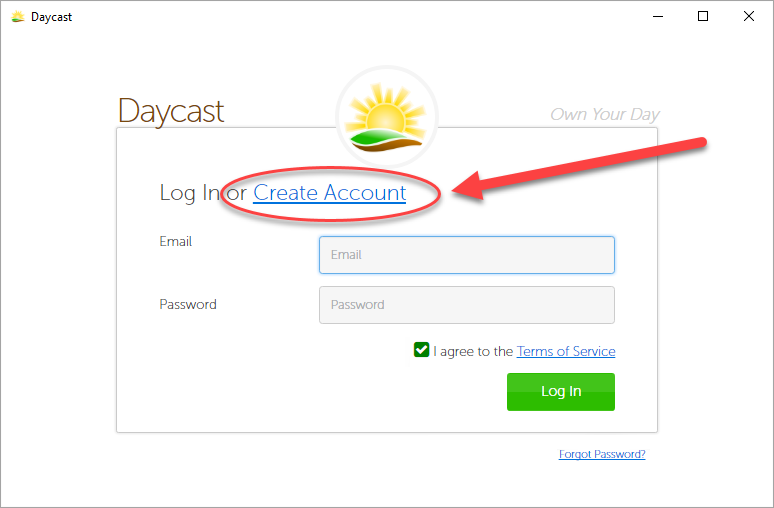 Fill out the form fields, and then you can log into Daycast with your new account. I’m already using Daycast and want to join a team. How do I do that? 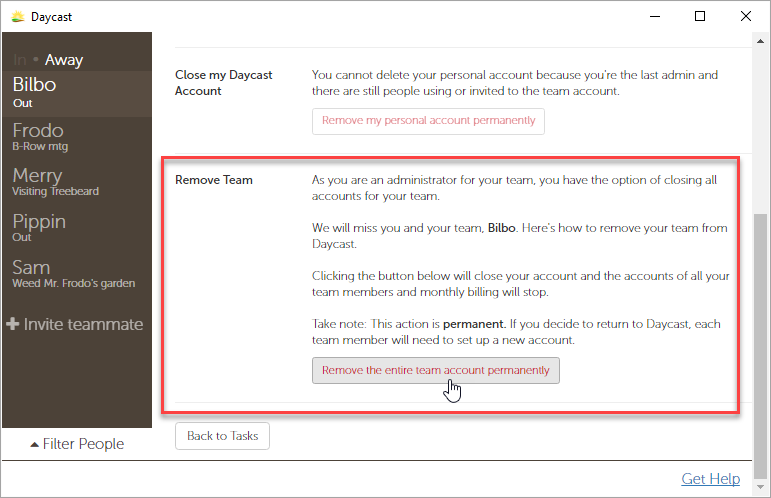 To move your existing account to another Daycast team, give someone on that team the email address associated with your account and ask them to invite you. You’ll receive an invitation via email to move your account. Just click the link in that email, follow the instructions, and you’ll be added to your new team. Note: your existing projects, tasks, and logged time will not migrate. Consider downloading a csv file of your data before transferring your account. How do I give someone else on my team admin capabilities? There’s currently no self-service way to assign admin privileges to another team member. However, we’re happy to do it for you. 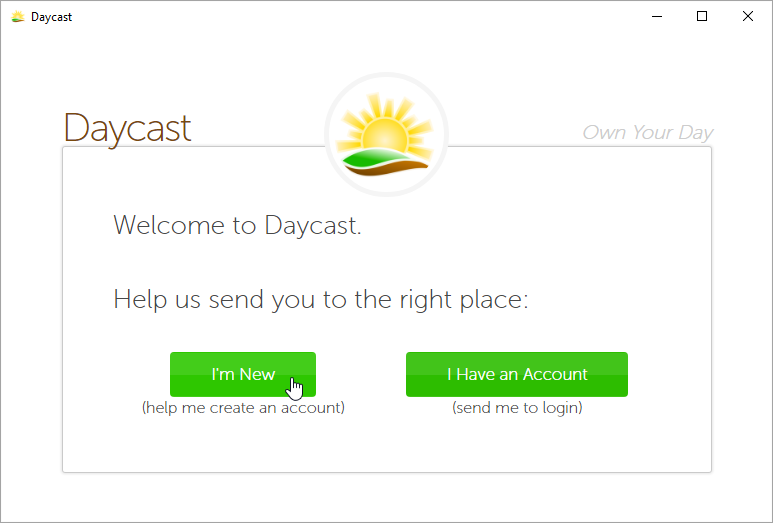 Email us at support@daycast.com and let us know who you want to have admin capabilities. We’ll take care of it. If you know your password and would like to change it, start by opening Daycast and logging in. Next, click the vertical ellipsis in the upper right corner and choose Settings from the dropdown menu. Navigate to the Account tab and click the Reset Password button. You’ll need to check your inbox for an email with the subject line: Reset Your Daycast Password. Follow the link in that email, choose a new password, and click the Submit button. 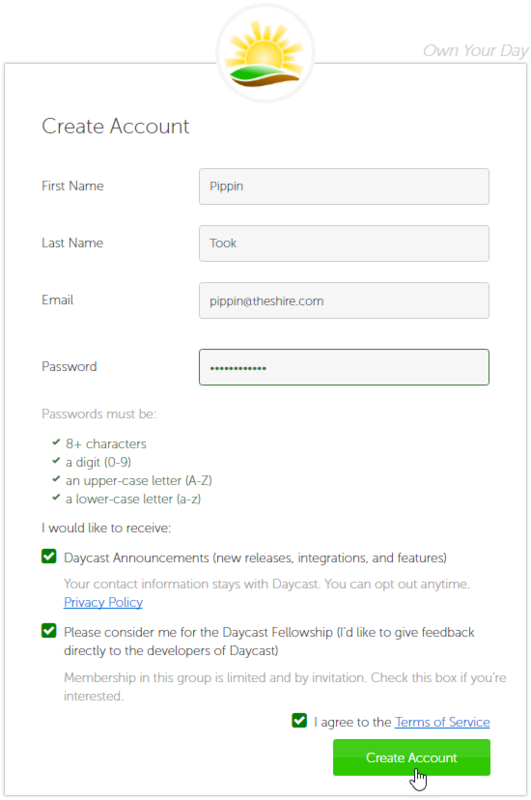 Now you can log out of Daycast and back in with your new password. 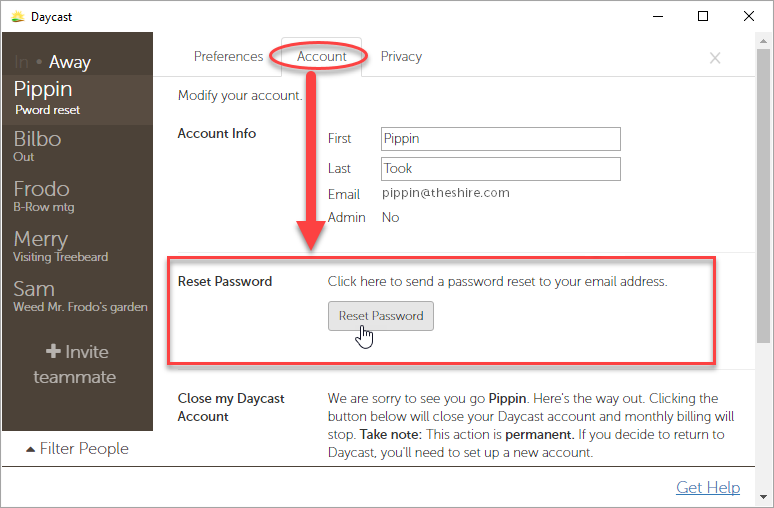 If you’ve forgotten your password and are unable to log into Daycast, click the Forgot Password? link on the login screen. 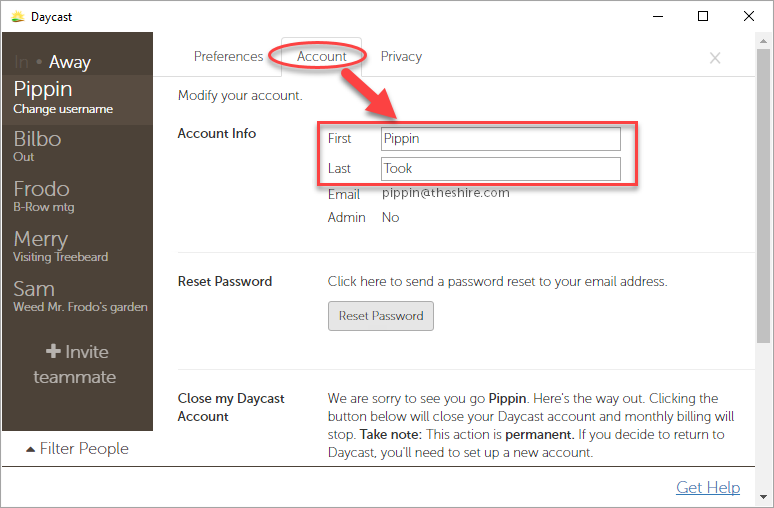 On the next screen, enter the email address associated with your Daycast account and click the Send Email button. 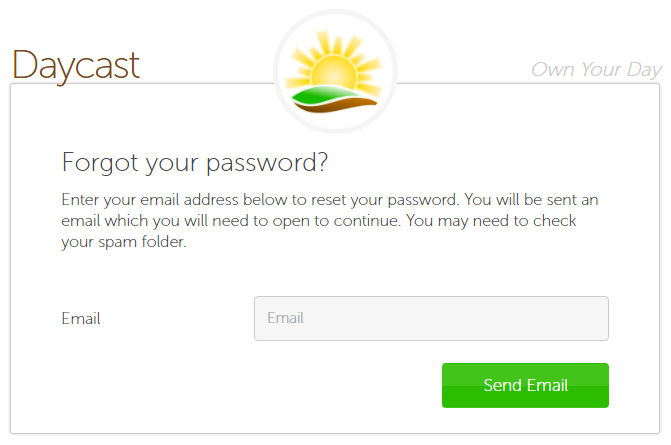 You’ll need to check your inbox for an email with the subject line: Reset Your Daycast Password. Follow the link in that email, choose a new password, and click the Submit button. 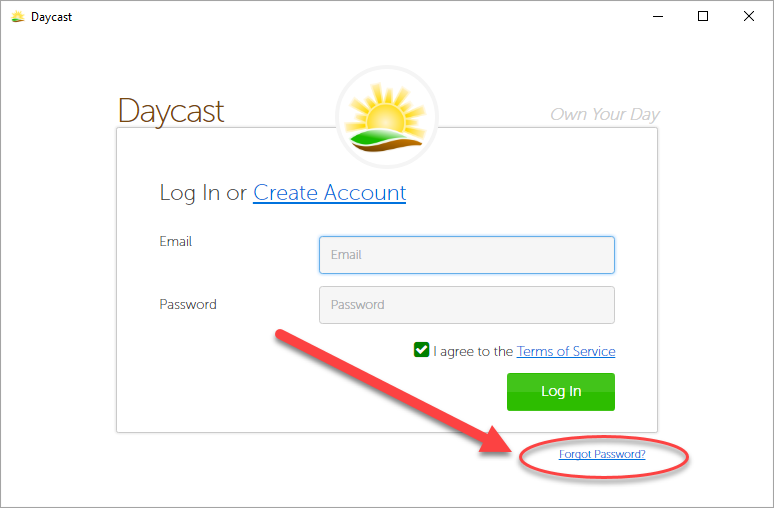 Now you can log into Daycast with your new password. Click the vertical ellipsis in the upper right corner of your Daycast app and choose Settings from the dropdown menu. Navigate to the Account tab and modify your first and/or last name in the Account Info section at the top. Note that Daycast displays only the first name field in the user panel unless it needs the last name’s initial to differentiate team members who share the same first name. There’s currently no self-service way to change your email address, but we can do it for you. Email us at support@daycast.com with your updated email address, and we’ll take care of it. How many members can I add to my team? As many as you like. There is no limit. Follow the instructions here to add people to your Daycast team. There’s currently no self-service way to remove a single team member. Email us at support@daycast.com with the name of the team member you’d like to remove, and we’ll do it for you. Keep in mind that when a team member is removed, so is all the data associated with their account. You may wish to export that team member’s hours prior to removal. To do that, click the lined paper icon in the upper right corner of your Daycast, choose your report parameters and click the Generate Report button. Once your report generates, click the Download CSV file text link at the bottom of the screen and save your file where and how you like. 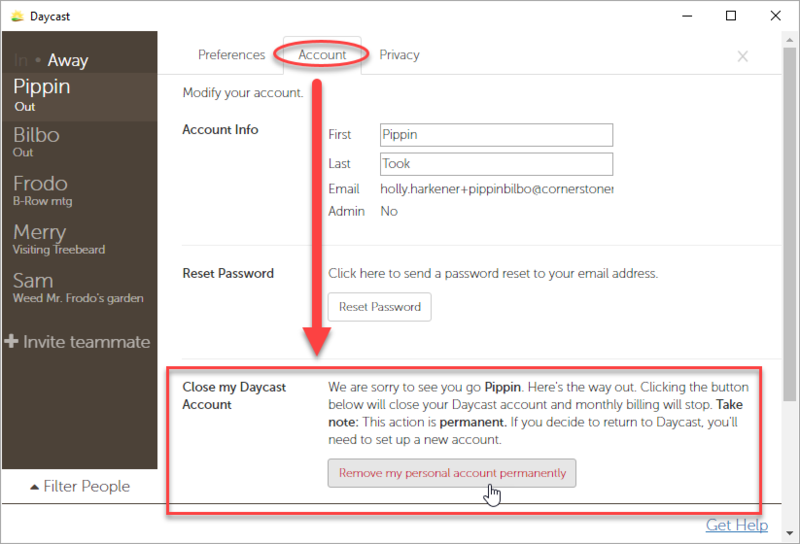 To delete your Daycast account, open the app and log into the account you’d like to delete. Click the vertical ellipsis in the upper right corner and choose Settings from the dropdown menu. Navigate to the Account tab and scroll to the Close my Daycast Account section. Click the button to delete your account. Admins, note: If you want to close only your account and not all accounts on your team, you’ll need to transfer admin privileges to another member of the team in order to do so. Contact us at support@daycast.com and let us know which member of your team to assign admin rights to. How do I delete my whole team? Admins can delete every team member’s account at once. To do so, make sure you’re logged into Daycast with your admin credentials, then click the vertical ellipsis in the upper right corner. Choose Settings from the dropdown menu and navigate to the Account tab. Scroll down to the Remove Team section. Click the button to delete your entire team. Sometimes I forget to switch tasks in Daycast when I start working on something else. Can Daycast help? Yes. Daycast will remind you of your clock-in status at the interval of your choosing if you enable Status Reminders. To do that, click the vertical ellipsis in the upper right corner and choose Settings from the dropdown menu. In the Status Reminders section at the top, first check the box, then set your reminder frequency and select the days of the week you’d like to receive reminders. Once you’ve enabled this feature, you’ll see notifications when you’re either A) clocked into a task for the duration of the time frequency you selected (e.g. thirty minutes), or B) clocked out of all tasks for the duration of the time frequency you selected. If you set your reminders for sixty minutes, but you change tasks more frequently than that, you won’t see a reminder. If you set them for thirty minutes and then work on the same task for thirty minutes (not clocking out of it at all), you should see a reminder notification. If you believe your status reminders aren’t working, try setting them to one minute then clock into a task and stay clocked in for one full minute to see if you get a notification. If you still don’t see your reminders, scroll down or click here for troubleshooting information. If I need to start a task at a certain time, will Daycast remind me, or do I need to set up a notification in some other tool? Time-specific Task Reminders are enabled by default in Daycast. To trigger this feature, use the 'at' symbol to specify a time in your task description, e.g. “@12:30pm call w/Jan” or “Review @9am.” You’ll receive a reminder alert five minutes prior to the time specified in your task description. To disable this feature, click the vertical ellipsis in the upper right corner and choose Settings from the dropdown menu. Scroll down to the Task Reminders section and uncheck the box. I’d like to be able to estimate how much time a task will take in order to better plan my days. Can I do that? Daycast will notify you that you've reached your estimate when the amount of time clocked against your task equals the amount of time specified in the task's description. Troubleshoot Notifications: I’ve enabled Status Reminders/Task Reminders/Task Time Estimates notifications but I never see them. Why? If you’ve enabled one or more of these options but aren’t seeing them, it may be that Daycast notifications are disabled in your system settings. Follow these instructions to enable them for macOS and these instructions to enable them for Windows. 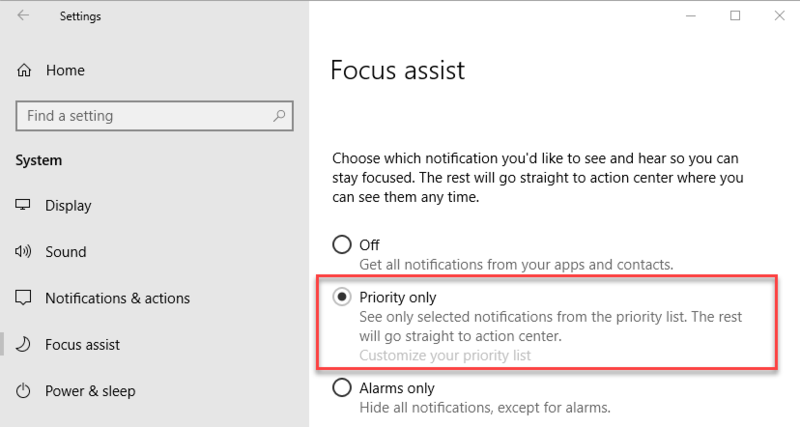 Windows 10 users who’ve enabled notifications both in Daycast and system settings but still don’t see reminders may have Focus Assist (formerly Quiet Hours) enabled, which is a do-not-disturb mode that blocks notifications. See this short video explanation of the Focus Assist features and how to access them. 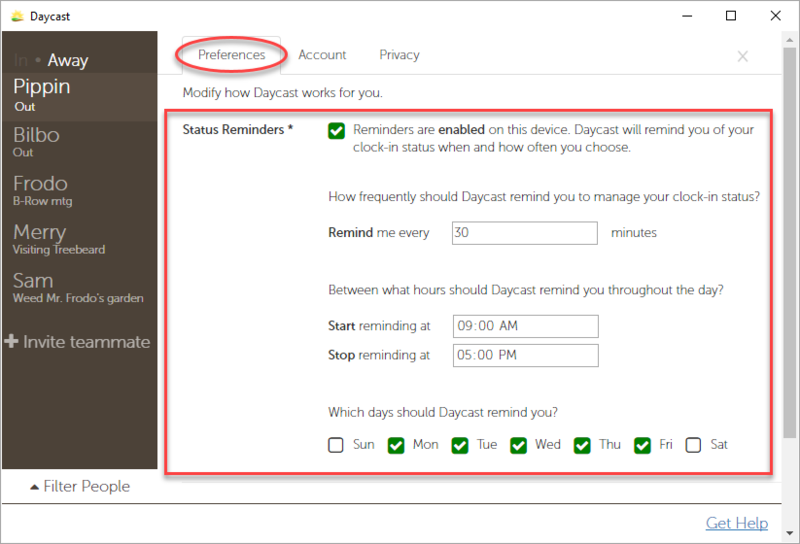 Windows 10 users who wish to enable Focus Assist while still receiving reminder notifications from Daycast may do so by choosing Priority only notifications in Focus Assist settings then customizing their priority list to include Daycast. If you’ve taken the above steps and still aren’t seeing your notifications as expected, please email us at support@daycast.com. My company has a strict confidentiality policy. How can I keep my work in Daycast private? One of the cornerstones of Daycast is team transparency, which means that your project names, task descriptions, hours tracked, and current status are visible to everyone on your Daycast team. In addition, certain members of our team must have backend access to Daycast data so that they can fix problems when they occur. However, we too have a strict policy: privacy. Please read it and let us know if you have any further questions about the security of your information. If I enable usage tracking, does that mean you’ll watch what I do in the app? No. By enabling usage tracking, users permit Open Door Teams to collect data that, when analyzed in aggregate, helps guide our efforts to improve Daycast. As a hypothetical example, usage tracking may tell us that around 75% of Daycast users regularly engage the Forecast Your Day feature for day planning. This information lets our development team know that the FYD feature is valuable to Daycast users and should be both A) kept and B) slated for regular upgrades. Usage tracking allows us to gather needed information about what matters most to our users without pestering them with interruptive requests for feedback. If I enable crash/error reporting, what kind of information will you get? Crash/error reporting delivers warnings to our technical team when Daycast encounters a difficulty. These warnings may be user-specific, but they are not about what you do inside the app; they’re about how the app itself is performing. Users who have crash/error reporting enabled allow us to solve certain problems before the issue can impact them—think of it as ‘precog’ for bug reports. For example, a bug in version 1.0.0 caused time submission failures for tasks that were both A) forwarded from a previous day and B) linked to a FreshBooks project via integration. Crash/error reports alerted our developers to the problem, allowing them to correct the time submission failures as they occurred and deploy a permanent bug fix in version 1.0.1. As a result, Daycast users were not affected by the problem. I’ve enabled crash/error reporting, and just encountered a problem. Should I email support@daycast.com anyway? Yes, please! Sometimes it’s difficult to pinpoint the cause of the issues that crash/error reporting alerts us to. Understanding how the problem surfaces for users can be a big help in situations like that. Please don’t ever hesitate to share your concerns with us, no matter how small you may believe them to be. How much does a Daycast subscription cost? See our pricing info here. There are no contracts or hidden fees. To help you determine if Daycast is the right fit for you, we offer a full thirty-day trial during which users have complete access to all features and support—there is no “trial version” of Daycast. Get started with your free trial here. Your subscription includes all of Daycast’s features and integrations. Subscribers can create unlimited tasks and projects, add as many team members as they like, and they have access to friendly, dedicated technical support. When new features or integrations are added, subscribers automatically have access to those too. Above all, you’ll get increased productivity as Daycast gently moves you towards work habits that allow you to extract greater value from your time. I’m ready to subscribe. How do I do that? Great! Solo users: Log into Daycast and find the trial info text link in the bottom right corner of the app (if your trial has just expired, this text link will appear in red). Click the link and a small pop-up window will appear with details about the status of your free trial and a Subscribe button. Click the button, then enter your billing details in the resulting pop-up window and click the blue Subscribe button to complete your sign-up. You should then see a message in the app letting you know that you’ve successfully subscribed and when you can expect your payment card to be charged. If you’re using Daycast with a team, the admin must subscribe the team using the steps outlined above from their Daycast. I already have a Daycast subscription. How do I change my billing details? 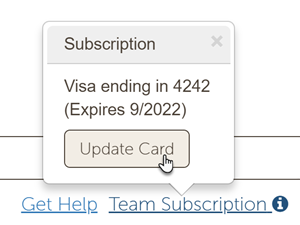 Click the Team Subscription link in the footer of your Daycast, then click the Update Card button. Enter your updated billing information in the resulting pop-up window, then click the blue Update Card button. Only admins can make subscription changes. If you’re a solo user, you are the admin. If you’re using Daycast with a team, your Daycast admin will need to update the billing information. One of my employees quit. How do I stop paying for their Daycast subscription? There’s currently no self-service way to update your team size. For the time being, you’ll need to email us at support@daycast.com and give us the name of the team member you’d like to remove. If it takes you a few days to get in touch, no problem. We’ll make sure you don’t pay for team members that aren’t actually using the service. I keep seeing tasks I won’t be using again in the list that appears when I click the plus sign to create a new task. How do I get rid of them? Recent: The task has been added to your day plan within the last seven days and not marked complete. Recurring: The task has been added to your day plan and marked complete at least twice within the last seven days. If the task you want to remove from the list classifies as recent, navigate to the last day on which you added the task, hover over it and you’ll see three glyphs appear to the right of the task’s associated project. Click the middle glyph—a checkmark—and the task in question will be marked complete. It will no longer appear in the pre-populated list of recent and frequently-used tasks. Note that if you’ve already finalized your time on this task, you’ll need to click the lock icon to open it for editing in order to mark it complete. Then simply click the lock again to re-finalize. 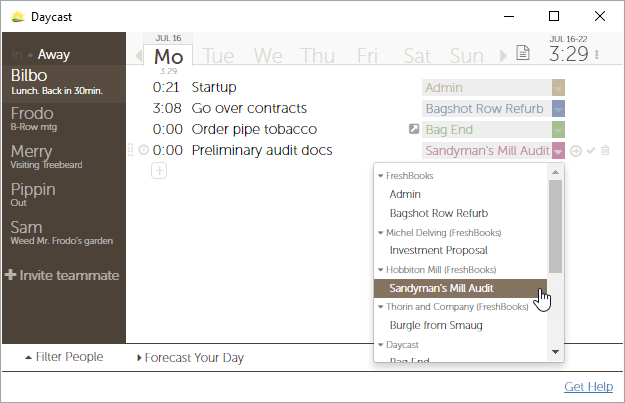 If the task you want to remove from the list classifies as recurring, you can either A) mark all but one of its instances in your day plan as incomplete and hit F5 to refresh Daycast and remove it from the autocomplete list, or B) wait until the seven day window has closed, when the item will drop off on its own. How does Daycast determine what tasks it shows in the autocomplete list that appears when I click the plus sign to create a new task? This list is populated with recent and frequently-used tasks. Tasks you’ve marked complete will not appear in this list unless you continue adding it to your day plan. For instance, if you add a task titled “Team meeting” to your day plan every Monday, Wednesday, and Friday, and you mark this task complete after the meeting ends each day, Daycast will recognize that it’s a recurring task and keep it in the pre-populated task list. Will Daycast remind me to start tasks at certain times? Yes, if you use the Task Reminders feature. Click here to learn how. Absolutely. Learn how to use Status Reminders here. I’ve enabled reminders, but I never see them. Why? There are a couple of possible reasons. Click here for help with troubleshooting notifications. I didn’t get to one of my task’s today. Can I move it to another day, or do I have to retype it? You can move it. Simply hover over the task you’d like to move, and three glyphs will appear to the right of the project you’ve associated with it. Click the first glyph—an arrow enclosed in a circle—and select the day you’d like to move your task to. You can move tasks forward by up to seven days. If you want to move a task to the immediate next day, you can speed up the process by double clicking the arrow. I finalized my day, but now I need to edit one of my tasks. What do I do? This is an easy fix. Click the lock icon to the right of the task you’d like to edit. This unfinalizes your task. Make your edits, then click the lock icon again to refinalize. That’s it! I accidentally logged time to the wrong project and finalized my day. What do I do? Navigate to the day on which you made the error, find the mis-tracked task and click the lock icon to its right in order to open it for editing. Now open the project dropdown menu next to that task and select the correct project. When you've finished making adjustments, click the lock icon again to re-finalize. If you’re sending your time on this project to FreshBooks, re-finalizing will correct your time entry there too. How do I edit a project name? Projects arriving via integrations must be changed at the source (e.g. in FreshBooks)—the integrated tool is the system of record for those. 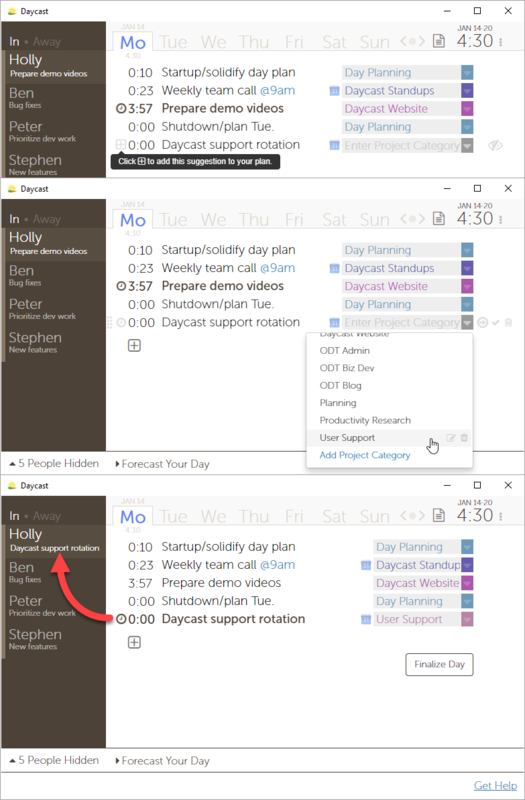 To change the name of a Daycast project, open the project dropdown menu and hover over the project you want to edit. At the right of the project’s name, you’ll see two small icons: a paper and pencil icon and a trash can icon. Click the paper and pencil icon to edit the project’s name. Make your changes, then click Update. If I delete a Daycast project, will the project’s associated tasks and time also be deleted? No. When you delete a Daycast project, you won’t be able to log time to it going forward, but all the time and tasks you’ve associated with that project in the past are preserved. I accidentally deleted the wrong Daycast project. How do I fix it? There’s currently no self-service way to un-delete projects, but if you email us at support@daycast.com and let us know which project you need resuscitated, we’ll take care of it for you. If I filter projects out in the Forecast Your Day panel, will those projects be removed from my Daycast altogether? No. Filtering projects in Forecast Your Day only affects what you see in the Forecast Your Day panel. All your projects will still be available to you in the project dropdown menu in your day plan. I’m terrible at day planning. Any tips? Yes! The two day-planning practices we recommend most highly (to makers and managers alike) are: 1) Add day-planning as a task in your day plan. Instead of viewing it as a thing you do in preparation for work, view it as a daily part of your work; 2) Whenever possible, start that day-planning task at the end of each workday, rather than at the beginning, reserving any morning day planning for adjustments, not from-scratch blueprinting. The point being that your warm brain today is good for jump-starting your cold one tomorrow, while your cold brain may be better at identifying lofty expectations and course correcting as needed. Read more of our thoughts on day planning in our blog. I like to keep my plan chronological, but sometimes I have to add a task after I’ve finished planning my day. Can I move it so it’s not at the bottom of the list? Yes, you can reorder the items in your plan whenever you like. Simply hover over the item you’d like to move and you’ll see a set of two vertical ellipses to the left of the task‘s timer. Click and hold those ellipses to grab the item you’d like to move, then pull it down or up to get it where you want it in your plan. The dotted line shows you where your item will land. When you’ve found the right spot, release to drop the item in place. As far as you like. Some Daycast users plan just one day ahead while others prefer to plan a whole week ahead. When taking time off, it can ease your re-entry to plan your first day back before leaving. I’d like to add a single task to multiple days at a time. Can I do that? There’s currently no way to add a task to multiple days at once. If this capability would make Daycast more valuable to you, please email us at support@daycast.com and let us know. If a significant number of users request that feature, we’ll add it to our roadmap. In the meantime, you can forward tasks to future dates (up to one week in advance) by first clicking the encircled arrow that surfaces when you hover over a task and then choosing the day you’d like to copy your task to. I’d like to estimate the time I’ll spend on each task in order to better plan my days. Can I do that? You can. Click here for instructions on using the Task Time Estimates feature. Who can make changes to my day plan? Only you. If an admin or supervisor would like you to make a change in your plan, they’ll need to ask you to make the change. All team members can view any other team member’s plan, but no one can alter any plan but their own. Will Daycast keep track of what time of day I started and ended each task? No. Each task you add to your day plan has its own timer. When you clock in and out of your task, Daycast keeps track of the total time spent. Time tracking with Daycast isn’t linked to time-of-day. What if I need to start a task at a particular time? Do I need to set an alert in a separate tool? No, Daycast will alert you five minutes prior to any times you include in your task descriptions. Click here to learn how to use the Task Reminder feature. I forgot to clock out of a task. How do I fix my time? Just click in the timer next to the task you’d like to edit and change your time total manually using your keyboard. Daycast can help you avoid this chore if you enable Status Reminders. Who can edit my time entries? Only you. If an admin or supervisor notices an error in your time, they’ll need to ask you to make any adjustments. 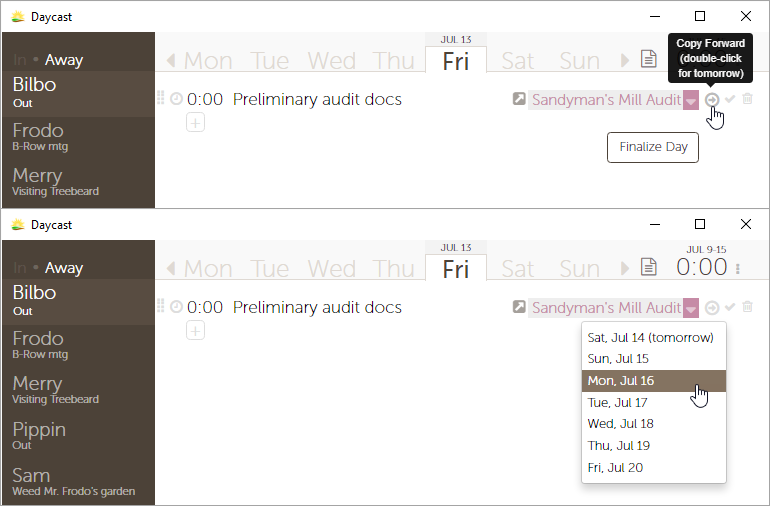 All team members can view any other team member’s time, but no one can edit any time but their own. Who can see my status in Daycast? Anyone on your team can see your status. Teammates who’ve filtered you out of their view won’t see your status, but if they filter you back in, they will. Who can see my day plan in Daycast? 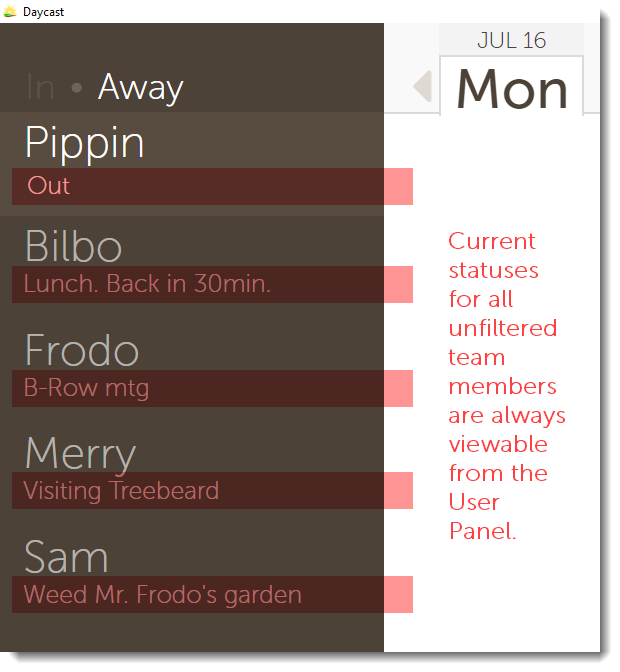 Anyone on your team can see your day plan by clicking on your name in their user panel. This brings them to your day plan, where their view is just like your own with one exception: No one can make changes, add tasks, or finalize your day but you. Teammates who’ve filtered you out of their user panel won’t be able to navigate to your day plan, but if they filter you back in, they can. I see my teammates’ current status in my Daycast, but I’d like to see what they’re planning to work on later today. How do I do that? Just click on their name in your user panel. You’ll see their entire day plan for the current day, and you can click on previous or future dates to see their past day plans or any they’ve prepared in advance. There are thirty users on my Daycast team, but I only work with five on a daily basis. Can I simplify my view? You can! Click Filter People (in the bottom left of your Daycast window) and uncheck all the names you’d like to remove from your view. When you’ve finished, click somewhere else in the app to collapse the filter menu and you won’t see the un-checked team members in your User Panel. To re-add a team member to your view, click [number of] People Hidden (in the bottom left of your Daycast window) and check the names you’d like to add back into your view. 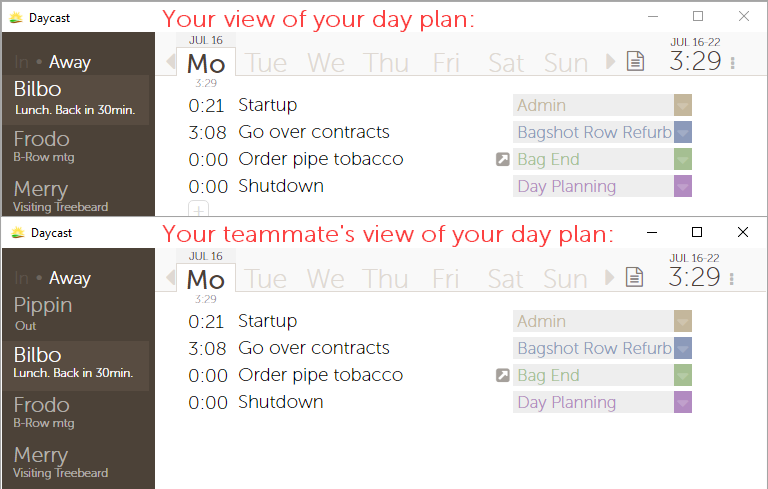 If I filter a teammate out of my user panel, can I still view their day plan? No. You’ll need to add them back into your user panel to do that. Just click [number of] People Hidden in the bottom left of your Daycast window, check the names of the users you’d like to add back in, then click somewhere else in the app to collapse the filter menu and see the newly added users. Now you can navigate to their day plan as usual by clicking on their name in your user panel. How do I run reports in Daycast? See: Use the Time Report Feature in the Track Your Time tutorial. Can I export reports from Daycast? Every report generated in Daycast includes a Download CSV file text link at the bottom of the report screen. Click that link, then name your file as you like, choose your download location, and save. What do reports in Daycast cover? Once you’ve run your report, you can drill down further into projects to see task descriptions and their time entries organized by date. See: Use the Time Report Feature in the Track Your Time tutorial. How do I integrate my FreshBooks account with Daycast? It's easy. Just follow the integration guide here. How do I add FreshBooks projects to my day plan? 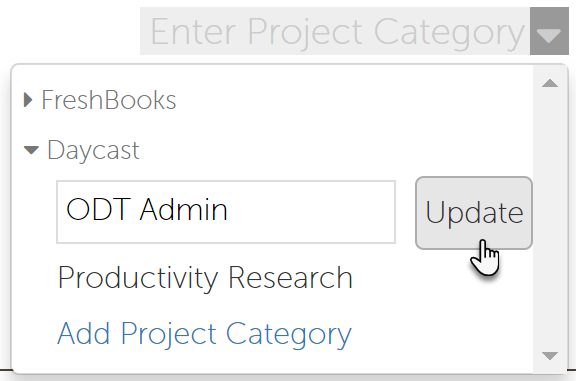 Once you integrate, all of your active FreshBooks projects will be available to you in Daycast via the project dropdown menu. How can my employees track time to my FreshBooks projects? If you haven't already, add your employees to your FreshBooks account and invite them to the FreshBooks projects you'd like them to work on. Next, your employees will need to follow these steps to integrate FreshBooks with their Daycast using their unique FreshBooks login credentials. All of the projects they're assigned to will then be available to them in Daycast, where they can plan and track time against those projects and send their tracked time to FreshBooks where it will collect until you’re ready to invoice. Can my contractors track time to my FreshBooks projects? FreshBooks contractors that have been assigned to your FreshBooks projects can track time against those projects in Daycast after they integrate. Those time entries will collect in their FreshBooks account, from which they can invoice you for their time on your projects. I accidentally tracked time to the wrong FreshBooks project and finalized my day. How do I fix it? In Daycast, navigate to the day on which you made the error, find the mis-tracked task and click the lock icon to its right in order to open it for editing. Now open the project dropdown menu next to that task and select the correct project. When you've finished making adjustments, click the lock icon again to re-finalize and send the correction to FreshBooks. Admins, note: Employees must correct errors from their Daycast; you cannot do it for them from yours. I accidentally tracked time to a non-FreshBooks project and finalized my day. How do I fix it? Navigate to the day on which you made the error, find the mis-tracked task and click the lock icon to its right in order to open it for editing. Now open the project dropdown menu next to that task and select the correct project. When you've finished making adjustments, click the lock icon again to re-finalize and send your time to FreshBooks. I got a message in my Daycast that the authorization to connect to FreshBooks has been revoked. What’s that about? This message appears when Daycast has been disconnected from FreshBooks via the Apps & Integrations screen, accessible from your FreshBooks dashboard. To reconnect, simply follow the link in the message. If you did not disconnect your integration and believe you’re receiving that message in error, please let us know by emailing support@daycast.com. 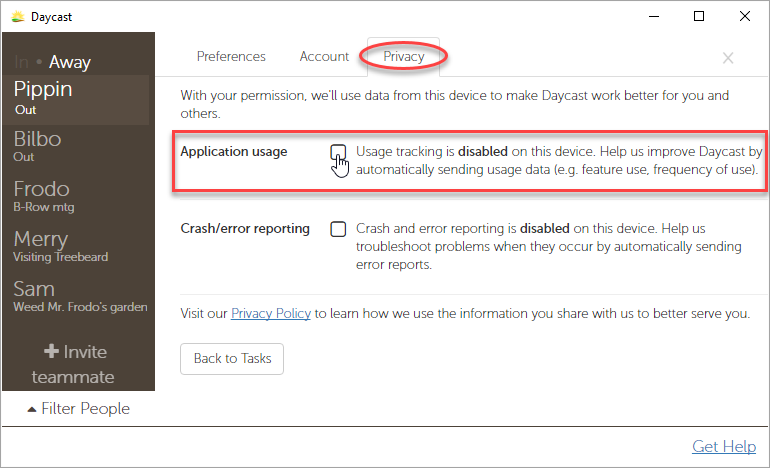 How do I integrate my Pivotal Tracker account with Daycast? Follow the integration guide here. I’m a member of several Pivotal Tracker projects. Which stories will be available to me in Daycast? Once you integrate your Tracker account with Daycast, all stories from all projects you’re a member of will be available in your Daycast, where you can add them to your day plan and track the time you spend working on them. Stories are organized by project in Daycast and ordered the same way they are in Pivotal Tracker. If you have several Tracker projects with lots of stories each, consider using the Search feature to find the story you want. A story was just added to Pivotal Tracker that I want to add to my day plan, but I can’t find it in Daycast. What do I do? Auto-refresh of Pivotal Tracker stories was deployed in version 1.4.0, so if you’re not seeing just-added Tracker stories in your Daycast yet, you only need to wait a few minutes. The syncer checks for new stories every five minutes. How do I integrate my Google Calendar with Daycast? Why do my Google Calendar events look faded out in Daycast? Items imported from Google Calendar appear automatically in your Daycast as mere suggestions, hence the lighter, faded look. Calendar items in this state aren't trackable, editable, or movable. They're also not visible to anyone but you. To make a Google Calendar item part of your day plan, click the [+] icon to the left of the suggested item you want to add. Once accepted into your plan, it will look like any other task with the exception of the Google Calendar icon that appears in the far right of the task field. Like any other task, you'll be able to edit it, clock into it, and choose a project category for it. Teammates can see accepted calendar items if they browse to your plan, or if your clocked-in status reflects a calendar item. If I forward an appointment imported from Google Calendar to a different day in my Daycast, will the change show up in my Google Calendar? No. This integration syncs data in one direction: from Google Calendar to Daycast. If you’d like to make changes to events in Google Calendar, you must edit the event in Google Calendar. 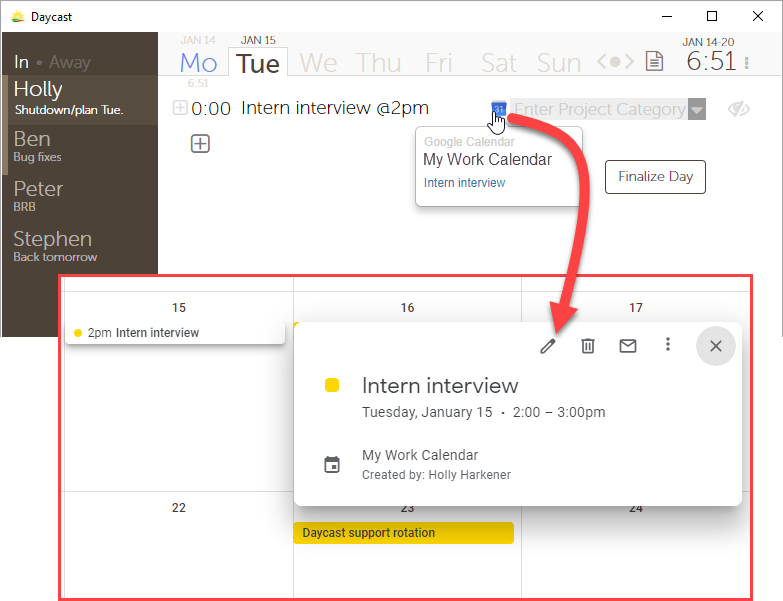 We’ve made this easy: Just click the Google Calendar icon in the far right of your task field and you’ll be taken directly to the event in your browser where you can make any changes you like. 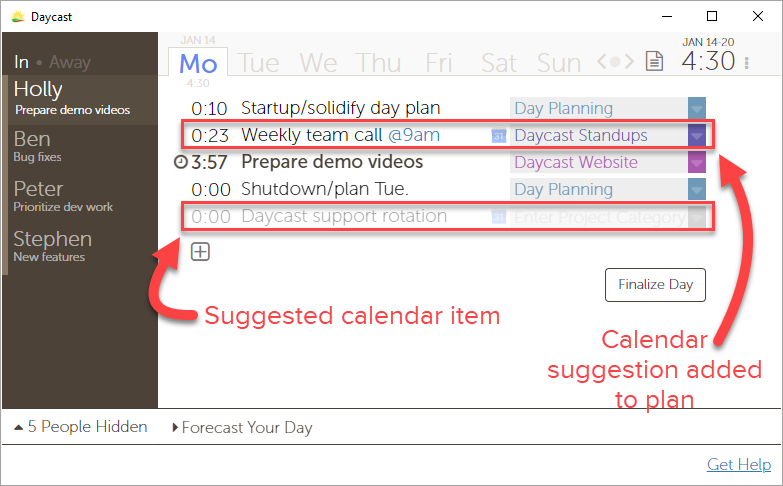 Changes you make to calendar items in Daycast will remain only in Daycast. Will changes I make in Google Calendar sync to Daycast? Yes. Note that the changes will take up to five minutes to arrive in your Daycast, and if your calendar item in Daycast is an accepted item in your day plan when you make changes to the original event in Google Calendar, you’ll need to return it to its suggested state in Daycast in order for the changes to sync. You’re free to re-add it to your plan after your edits appear in Daycast. How do I remove a calendar item from my day plan without deleting it? Go ahead and click the trash can icon that appears to the right of your task when you hover over it. “Deleting” calendar items merely returns them to their suggested state. How do I delete a calendar item from my day plan altogether without deleting it in Google Calendar? You can hide suggested calendar items by clicking the icon to the right of the project category field. If your item is not recurring, it will simply disappear. If your item is recurring, you'll need to choose whether you'd like to hide just the one instance or all of them. When there are hidden calendar items in your day plan, you'll see an eye icon between the last task in your plan and the Finalize Day button. Click that icon anytime to see the items you have hidden in that day's plan. 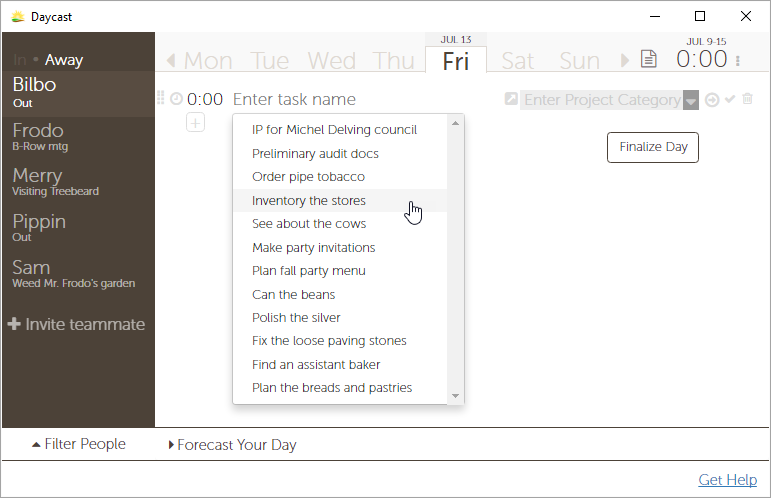 You can add any of those items to your day plan by clicking the [+] icon to the left of the item's task field. Re-hide hidden items by clicking the eye icon again. Does the Google Calendar integration support Google Reminders and Google Tasks? No. It’s possible that Google Tasks may one day be supported, perhaps as a separate integration. If this capability would make Daycast more valuable to you, please let us know. At this time Google does not provide a Reminders integration endpoint. When Google provides such an API, we will consider expanding this integration to include Reminders.